MARCH 19, 10:22am: The Bucks have officially signed Frazier to a rest-of-season deal, according to a press release from the team. MARCH 18, 11:05am: The Bucks have officially waived Wood, the team announced today (via Twitter). MARCH 18, 9:32am: The Bucks are making a change to their 15-man roster in the wake of Malcolm Brogdon‘s foot injury, according to Chris Haynes of Yahoo Sports, who reports (via Twitter) that the team will sign free agent guard Tim Frazier. Milwaukee will waive forward Christian Wood to open up a spot for the new addition. It’s a logical move for the Bucks, who carried Frazier on their roster during training camp and the preseason last fall before releasing him. 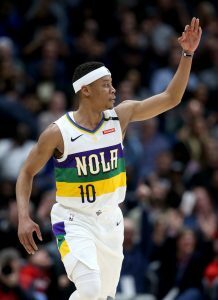 The 28-year-old was claimed off waivers by the Pelicans at that point, but once New Orleans fell out of playoff contention in February, the club cut Frazier to take a flier on EuroLeague sharpshooter Dairis Bertans. In 47 games (17 starts) this season with the Pelicans, Frazier averaged 5.0 PPG, 4.4 APG, and 2.9 RPG with a .451/.351/.780 shooting line. Signing Frazier will allow the Bucks to address an area of need, with Brogdon expected to miss approximately six to eight weeks due to a minor plantar fascia tear in his right foot. However, the move will cost the team Wood, who was a “valued member” of the organization, as Haynes tweets. The 23-year-old played sparingly for Milwaukee this season, but has put up massive G League numbers, averaging 29.3 PPG, 14.0 RPG, 2.4 APG, and 2.1 BPG on 55.9% shooting in 28 games (35.3 MPG) for the Wisconsin Herd. He’s expected to draw interest from other NBA clubs, per Haynes, though he wouldn’t be playoff-eligible this spring. If Wood goes unclaimed on waivers, the Bucks will remain responsible for his $1,512,601 cap hit for 2018/19, but would be off the hook for $1,645,357 salary for 2019/20, since it’s non-guaranteed. Wood might be an appealing target on waivers though, since his two-year, minimum-salary contract allows any club to place a claim using the minimum salary exception. If he’s claimed, his cap charge would be removed from Milwaukee’s books. Frazier, meanwhile, would have a $205,098 cap hit for the rest of the season if the Bucks officially sign him today. Cleveland needs to pick up CW ASAP. The Bulls should give CW a shot, with some real minutes he could surprise. You mean compared to all the other 15th men on a roster? Yeah, I mean Christian Wood started playing in 2015 and since then he has appeared in 43 games and averaged 7 minutes and 3 points. I agree they don’t need an experienced backup PG. They need a guy they don’t trust to play like Wood. What is his problem stepping up to the big show? Because he hasn’t. He's gotten the promotions, but then put up very different statistics.